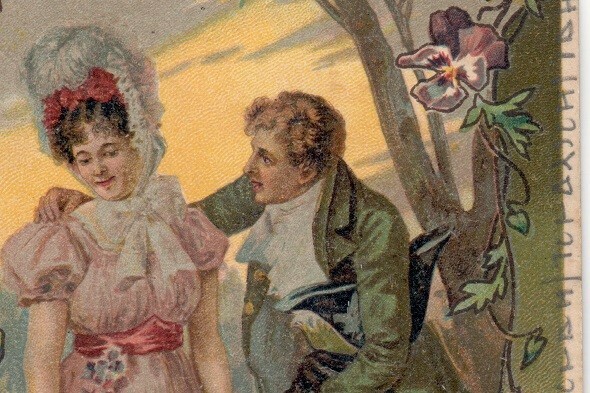 Who can solve this aristocratic postcard? 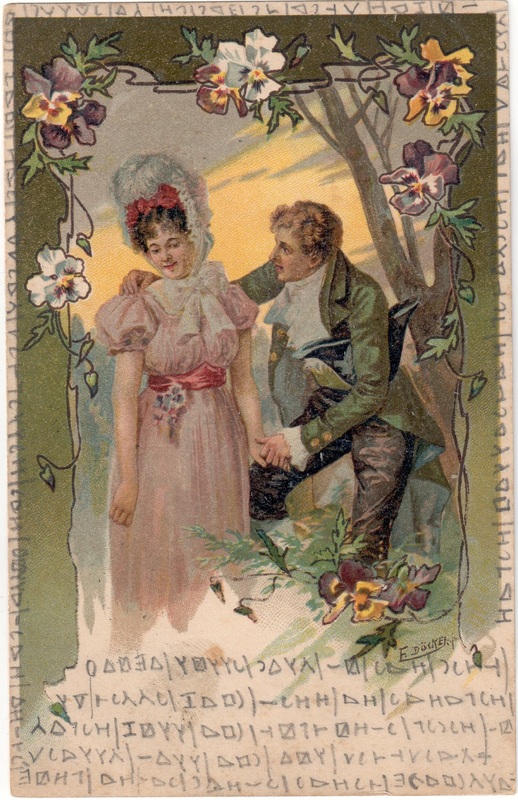 Today’s crypto mystery is about a postcard written to a noblewoman in 1914. Can a reader solve it? Once again, comedy hacker, crypto book expert, encypted postcard collector and friend Tobias Schrödel has provided me one of his treasures. Some of these encrypted postcards were covered on this blog. My readers solved them all. There are several places named Semlin in Europe. 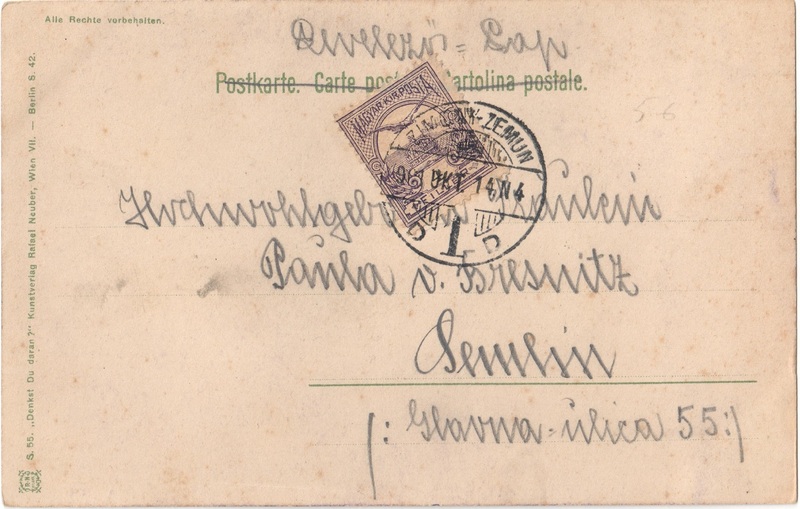 As this card was sent from Hungary (the stamp is Hungarian) and as the address is partially written in Hungarian, the Semlin in question here is probably the one that is today called Zemun and located in Serbia. Before World War I, Semlin/Zemun belonged to the Austrian-Hungarian monarchy. The recipient of the card was an unmarried woman named Paula von Bresnitz. The “von” in her name and the German salutation “Hochwohlgeboren” indicate that she was a noblewoman of German decent. 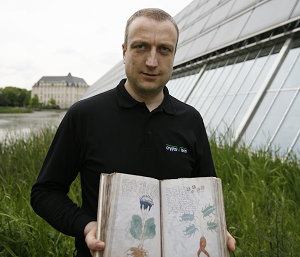 In fact, there is a German aristocratic family named “von Bresnitz”, which has its origin in Eastern Europe. 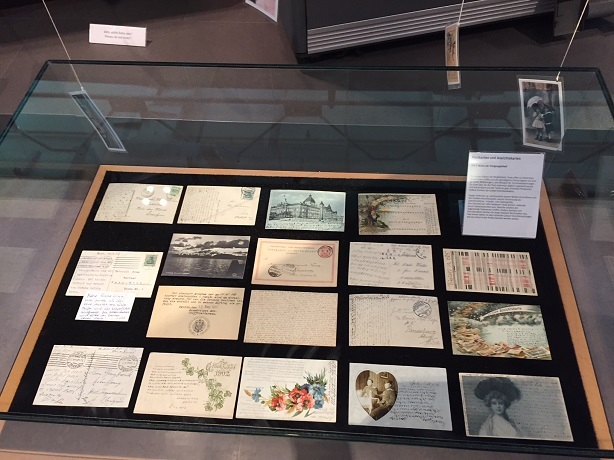 The sender of the postcard probably was the lover of Paula von Bresnitz (most encrypted postcards were sent by young men to their spouses). The cleartext language is most likely German. The cipher used is probably a MASC with the vertical lines indicating spaces. I’m sure this is not an especially sophisticated encryption. Can a reader solve it? Hast du ein Herz? Bitte mach, denn in einigen Tagen muss ich zugrunde gehen. Du weisst, dass ich aus Verzweiflung an die Hände einer leichtsanigen (?) Cassaerin (?) geraten bin. Wärest du min..rei geblieben, s..gässe(?) ich mich …. vergessen. Ein Bussi, Dein Andre. Hast du ein Herz? Rette mich, denn in einigen Tagen muss ich zugrunde gehen. Du weisst, dass ich aus Verzweiflung an die Hände einer leichtsanigen (?) Cassaerin (?) geraten bin. Wärest du min..rei geblieben, so hätte ich mich nicht soweit vergessen. Ein Bussi, Dein Andre. Aber was ist eine “leichtsanige Cassaerin”? Oder ist da ein Fehler drin? …”The cipher used is probably a MASC” … What is a MASC cipher?